For about fifteen years, I was a volunteer firefighter and EMT. When we responded to a medical call, it was not unusual for us to transport the patient to the appropriate hospital for further care. This could be for a variety of causes, but many of these calls were for an apparent heart attack. One of the things that we always did, if time permitted and we were at the patient's home, was to gather the medications that the patient was currently taking and take them with the patient so that the emergency doctors would have a more complete picture. Some patients had these ready for us; for some others, we never found what they had taken that day. There is a system which we now often see called "Vial of Life". This consists of a magnetic sticker to place on your fridge and instructions to have you prepare a list of your meds and place that list in your fridge. The EMTs know to look on your fridge, and if there is a sticker there, to look in your fridge. 1. 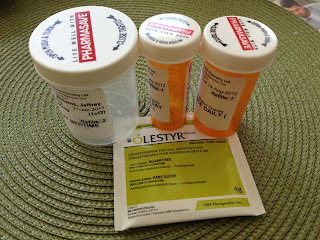 Take one of your empty pill bottles and put one pill, from that prescription, in that bottle. 2. Do the same for all of your medications. 3. Put all of the pill bottles, with at least one pill in each in a ZipLock Bag. 4. Put your medication schedule in the same Bag. 5. Put that Bag in a place where the EMTs can quickly find it. Your fridge is a good, common place that they can find quickly. 6. Put a sticker on the outside of your fridge telling the EMTs that your meds are in the fridge. It is so important for you, when you get taken to the emergency room (with your next heart attack), that they quickly know as much about you as they can. This includes your medications. With this bag of your meds (and other information), it will dramatically reduce the time for them to know what to do to save your life. The other thing you should add is the reference to your Road ID (http://www.roadid.com ). See our previous post for more information on the Road ID. Until two-and-a-half years ago, I was fairly healthy. I was still playing hockey twice a week, as I had for about sixty years. I still skied, jogged, biked. All the regular stuff. Then, with any warning, I had 15 heart attacks in one day. I had had about five of the attacks by the time the EMTs arrived but the attacks presented as a sharp pain in the left shoulder blade. The EMTs arrived and ran their tests. They assured me, from their tests, that it wasn't cardio. And so, they took me to the nearest hospital but not the Heart Institute. I apparently died a couple of times on the table, but they shocked me back each time. By the next morning, I was transferred to the right place and the repair work began. Once I got back home and began rehab exercises, including riding my bike again (carefully), I was introduced to Road ID (http://www.roadid.com ) by my son. It's a clever idea and answered a problem that I didn’t realize I had. The problem was, if I did have another attack while on my bike (or doing anything else), I might not be able to explain my medical history and the meds that I was on. Imagine the time lost once you arrive at a hospital if they don't know your history. They might think you had just a fainting spell or were intoxicated. Or you might be unconscious. The Road ID has your medical information in one of two forms, either 1) on you as necklace tags or a bracelet or shoe tags and 2) available online on their website. I couldn't decide which made more sense for me. I could see the benefits of each approach and decided to do both. 4) the website, with serial number and pin number, for all my medical information. I really don’t want anyone to have any doubts about my previous medical history nor my current meds . The toll-free phone number and the website are both resources for the EMTs, physicians and cardiologists to get fast and easy access to your history. There are templates to help you add your information and lots of free-form space. Mine has 18 pages of medical history and information relating to my heart. And you can update the online information easily from your computer, as often as you like. No cost. The cost for the tags is about $20-$25 and an ongoing annual fee, if you use the website for your information. I don't remember the annual cost but I think it's $10. It renews automatically which is why I don't remember the cost. But I remember that it's insignificant compared to saving valuable minutes saving your life. I think it's a great idea and I definitely feel more secure. If you still need convincing, go to www.roadid.com and read some of the testimonials.